All transactions are safe and secure with a reliable history in online purchasing behind each of our associates. Buy the Blackbeard t-shirt to own Pirates of the Caribbean clothing and merchandise. Also available on a kids' t-shirt, ringer, baseball jersey or hoodie, the Pirates Blackbeard tee is a great way to show your preference for pirate living. 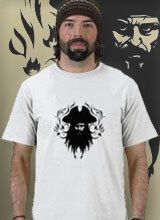 The tee features a dark vector design of Edward Teach, more famously known as the pirate Blackbeard. In the movie On Stranger Tides he captains his ship, Queen Anne's Revenge, in search of the Fountain of Youth. This design, which emphasizes his heavy black beard and hat, is also available in kids' styles or on mugs, steins and mouse pads. Click the shirt on the left to browse the available products. In addition to the Blackbeard tee above, browse the Pirates of the Caribbean Clothing Gallery for more apparel like men's and women's clothes, kids shirts or hoodies.